So, yesterday this rooster voluntarily bought a blazer. 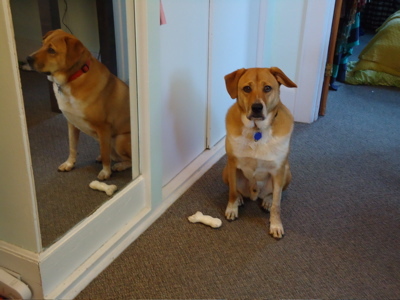 My first thought, in the dressing room: Wait — does this make me a grown-up? (As soon as I walked out of the Gap, I called my mother. I knew she’d be proud. I mean, I did own a blazer in high school, but it was more of a costume. I wore it for Mock Trial. This time, I actually went looking for the blazer.) Feel free to skim down to the actual knitting at any time, because I’m going to keep talking about this. Every season, but in the summer, especially, I try to purge things I don’t wear/don’t need from my closet/life. And this year I had a realization. I am harboring two entirely different wardrobes: one for the girl who lives in ripped jeans and beat-up carhartts, fleece, long underwear, plaid shirts and puffy vests while she camps, cooks, and wanders, and one for the girl who wears dark jeans, big jewelry, and aims to at least feel like a confident/hip grad student as she attends classes and meetings, reads, and teaches section. The line between these two roosters is blurrier than I’m making it sound here, and I hope it stays that way. I don’t want to lose that first girl — and I’m not just talking about attire — to the second. And I don’t think I will, though I want to be mindful of the ways in which my life has changed over the last few years. I had to chuckle, though, when I realized that I could no longer just get rid of things I haven’t worn in the last year — because the next time I’m in the desert, the next time I’m pitching a tent, the next time Boh and I are adventuring — I’m going to both want and need that stuff! 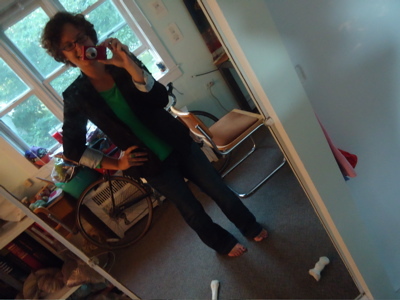 Besides, there’s something about a blazer that dresses up even the rattiest, most comfortable shirt. 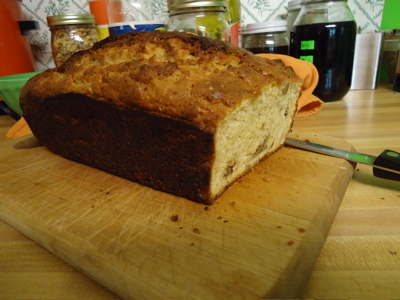 It is zucchini-time at the farm, which means it is zucchini bread-time in my kitchen. Here’s the first loaf of the summer. Yum. Boh wants you to know that he is being VERY good this morning. 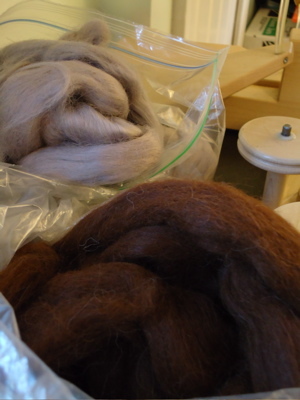 A knitterly friend has proposed a trade: I’ll spin this fiber, and she’ll do something painterly (her work is stunning) or sewing-related for me! I am really excited to dive into this spinning project. These bags of natural fiber are both labeled alpaca, though I’m thinking that the brown stuff is a blend…or at least baby alpaca. It is so much softer! I’ll keep you posted on my progress. 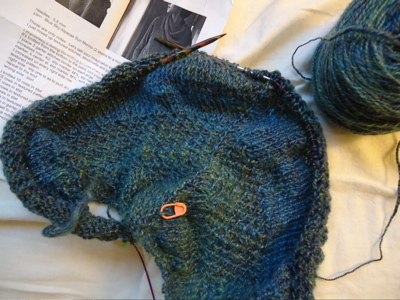 This entry was posted in grad school, kitchen, knitting, life, spinning and tagged alpaca, baking, blazer, boh, fiber, grad school, handspun, knitting, life, spinning, textured shawl recipe, zucchini bread by barefootrooster. Bookmark the permalink. I can totally relate to the blazer situation – I started wearing them after I realized that I looked like I should be sitting in my class when I’m actually teaching it. Most of the week I slouch around in corduroy trousers, t-shirts and cardigans but twice a week I have to dress up. It feels strange sometimes, like I’m leading a double life ;-) AND my mother was very relieved when I started dressing like a respectable grown-up at least part-time! (no more blue hair and Doc Marten’s). Oh, and you look very smart in that blazer! I love it!! 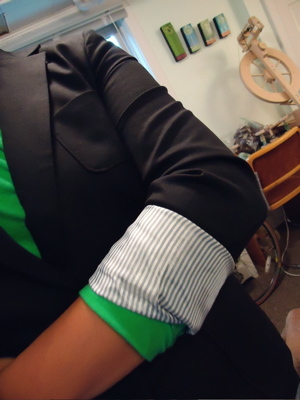 Yes, a traditional blazer is “grown up” wear, but with the cuffs rolled up like that and worn with the bright green tee it looks oh-so-cool. It’s professional and hip at the same time. Your zucchini bread looks amazing, and very different from mine! Would you mind sharing your recipe? I have 3 monster zucchinis on my counter waiting to be shredded! You won’t ever lose that first girl. You’re a rockin’ adventurin’ rooster. You look awesome in your blazer! I love blazers, but can never find ones that fit me well. I’ve been trying to “grow up” my wardrobe in the past year, mostly because I’ve been teaching-for-real instead of just TAing, and as someone who looks pretty young for her age, Threadless tees and hoodies and beat-up cords doesn’t really do much for distinguishing me from the undergrads I’m teaching (and who I’d like to take me seriously, at least sometimes! ).